LONDON The partner of a journalist who received leaks from former National Security Agency contractor Edward Snowden was detained for nearly nine hours Sunday under anti-terror legislation at Heathrow Airport, triggering claims that authorities are trying to interfere with reporting on the issue. David Miranda, the partner of Guardian reporter Glenn Greenwald, was held for nearly the maximum time authorities are allowed to detain individuals under the Terrorism Act's Schedule 7, which authorizes security agencies to stop and question people at borders. Greenwald said Miranda's cellphone, laptops and memory sticks were confiscated. "This is obviously a rather profound escalation of their attacks on the news-gathering process and journalism," Greenwald said in a post on the Guardian website. "It's bad enough to prosecute and imprison sources. It's worse still to imprison journalists who report the truth. But to start detaining the family members and loved ones of journalists is simply despotic." In a separate interview with CBS Radio News, Greenwald called this latest event "extremely disturbing. First of all, it's a complete misuse of their own law. The law is called the Terrorism Act of 2000. It says right in the law that it's for the purpose of investigating people who are associated with terrorist organizations or involved in terrorist plots, which obviously had nothing with what caused them to detain him or what they asked him about. Secondly, it's incredibly menacing for governments to not only target journalists who are publishing stories that they dislike, but the family members and spouses of journalists. It's designed to be bullying and intimidating." Greenwald: Snowden documents detail NSA "blueprint"
Greenwald has written a series of stories about the NSA's electronic surveillance programs based on files handed over by Snowden. The former contractor fled the United States and is now in Russia, where he has received temporary asylum. The 28-year-old Miranda was returning home to Brazil from Germany, where he was staying with Laura Poitras, a U.S. filmmaker who has worked with Greenwald on the NSA story, Greenwald said in his post. He also said British authorities had "zero suspicion" that Miranda was linked to a terror group and instead interrogated him about the NSA reporting and the contents of the electronic equipment he was carrying. He wrote: "If the U.K. and U.S. governments believe that tactics like this are going to deter or intimidate us in any way from continuing to report aggressively on what these documents reveal, they are beyond deluded. If anything, it will have only the opposite effect: to embolden us even further." London police acknowledged that they had detained a 28-year-old man at 8:05 a.m. He was released at 5 p.m. without being arrested, the Metropolitan Police Service said. "They kept David detained right up until the last minute: for the full 9 hours, something they very rarely do. 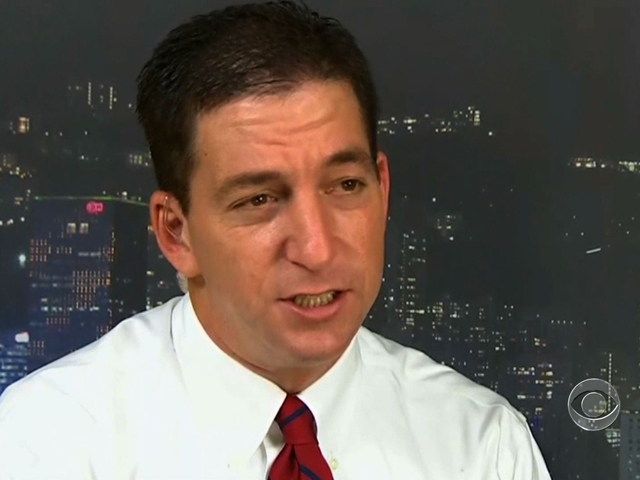 Only at the last minute did they finally release him," Greenwald said. "This was obviously designed to send a message of intimidation to those of us working journalistically on reporting on the NSA and its British counterpart, the GCHQ." The Home Office says in a report released last year that more than 97 percent of those questioned under Schedule 7 are detained for less than an hour. Less than a tenth of 1 percent are held for more than six hours. Some 230,236 people were questioned under Schedule 7 from April 2009 through March 2012. Schedule 7 is designed to help authorities determine whether people crossing U.K. borders have been involved in the "commission, preparation or instigation of acts of terrorism," according to the Home Office report. Border agents are not required to have reasonable suspicion before detaining a traveler. Examining officers may require travelers to answer questions or provide documents. Detainees may be held for up to nine hours if they refuse to cooperate, the Home Office report said. Greenwald's post said the Guardian sent lawyers to the airport. Detainees have the right to legal representation, though publicly funded legal advice is not guaranteed. The Brazilian government expressed "grave concern" over the detention of Miranda, Greenwald's longtime partner with whom he's in a civil union. The pair lives in Rio de Janeiro. Brazil's Foreign Ministry said in a statement Sunday that Miranda was "detained and held incommunicado." The statement went on to say that the foreign ministry considered the detention "unjustifiable, as it involves an individual against whom there are no accusations that could possibly legitimize the use of such legislation." In an interviewwith CBS News correspondent Nancy Cordes back in June, Greenwald was asked if he had any concerns that making these NSA programs public will reduce the effectiveness of the programs or tip off terrorists? "No," he said. "Terrorists already know because it's been discussed openly for many years that the government tries to eavesdrop on their conversation. Any terrorist who doesn't know that the government is going to try to eavesdrop on their conversation or read their email is not a terrorist who is ever going to be able to do anything effective."